Look, I know that we're posting this on April 1st, but this isn't a joke. There's seriously enough stuff going on in April that we needed to make a post about all the other posts that we're going to make this month! So, here's a quick overview of what big stuff's going on that we'll be talking about and when we'll be talking about it. And if you bookmark this blog, we'll update it as the other stuff goes live to give you a handy reference point. 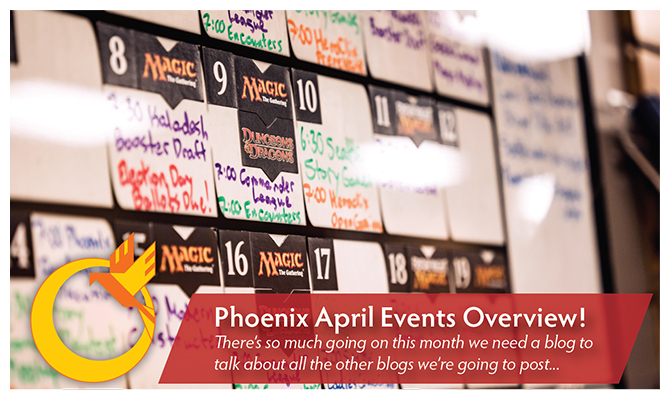 If you're looking for information about the Magic Open house on April 15th or the Amonkhet Prerelease on April 22nd and 23rd, this is the post to be looking for! We'll be posting it at the same time that preorders and preregistration for the prerelease events will go live too! We'll announce our demo line-up for International Tabletop Day on April 17th, and we'll talk about some of the various swag we'll have available for that day too! If you're a board gamer and this event speaks to you (and you'd like to help us make Tabletop Day 2017 a success), you can sign up to help demo awesome games here! We'll keep signups open through this form all the way through April 16th. Since Amonkhet releases the day before Tabletop Day 2017, we'll release our event schedule for that weekend once we've got our Tabletop Day lineup set! Expect lots of drafts on Friday and Sunday and maybe maybe a sealed event somewhere in there too! April 28th - Free Comic Book Day Information! Ahhh Free Comic Book Day, a day of wonder and, well, free comics. We'll have a full list of what we've got planned for the first weekend in May (FCBD is May 6th this year) as well as our 4th Year birthday, tune in April 28th for more information!